Anonimo, a quality watch brand founded in Italy in 1997, mixes Florentine artisan tradition, Italian elegance and Swiss watchmaking precision. On sale at the Grimoldi store in Piazza Duomo in Milan, the watch collections add to the classic models the new born ‘Nautilo Leopard Watch’, dedicated to the Leopard Racing MotoGP team. With a special signature on the back dedicated to the Team, the watch is presented by the two Italian Moto 3 riders, Enea Bastianini and Lorenzo Dalla Porta, and combines contemporary technology with a sporty allure, in bold blue and black colors. The new Anonimo watch model, identifiable thanks to the crown positioned at 4.00 am, reflects 100% the characteristics of these two promising pilots. Resistant to knocks and water (up to 200m), its case with a unidirectional rotating steel bezel is protected by a domed sapphire crystal with anti-reflection treatment. Mechanical movement Sellita SW200-1 with automatic winding made in Switzerland, dated at 6.00 and its indices are made by the Swiss Super-LumiNova. The cordura effect and leather strap are produced with a special fire-retardant material like the uniform worn by the drivers in the race. 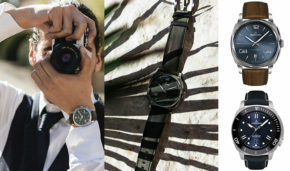 Among the three edited lines, Military, Nautilo and Epurato collections, the elegant and sporty allure are equipped with original constructions, with a staggered crown at noon or at 4 (and in case of Epurato line at 3 o’clock), both for the date or chronograph version, designed for athletes and for those who prefer a high-performance wristwatch without sacrificing elegance.